TVHS senior Farzana Musomi works with eighth graders from Wynantskill during a school visit on Friday, Oct. 28. 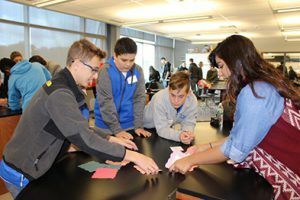 Eighth graders and staff from the Wynantskill Union Free School District got a chemistry lesson from Tech Valley High School seniors on Friday, Oct. 28. The seniors led project- and problem-based activities, showed the eighth graders their 3-D models of the periodic table and told them what it’s like to attend TVHS. Wynantskill Superintendent Dr. Thomas Reardon said seeing students “in action” on a typical Friday allowed him and his students to truly capture what the TVHS experience is, rather than seeing a special presentation. He said the visit will be used to benchmark the eighth graders’ high school selection process, as Wynantskill is a K-8 district. The visit was organized through the TVHS School Outreach Program, which aims to develop and advance meaningful partnerships with local component school districts for collaborative activities and professional development. Since the beginning of the school year, TVHS has partnered for professional development and collaborative activities with Germantown, East Greenbush, Chatham and New Lebanon school districts. The outreach program provides opportunities such as free Professional Learning Communities, data analysis, instructional rounds and PBL immersion. Visit our Professional Development page for more information.